The TLR-2 HL G with green laser supplies an 800 lumen blast of sunshine for optimum illumination even as clearing a room or looking an alley. Its wide beam pattern lighting fixtures up huge spaces so you’ll be able to identify who or what is nearby. C4 LED technology, impervious to shock with a 50,000 hour lifetime; 510-530nm direct drive green laser with wide operating temperature vary. 800 lumens; 15,000 candela peak beam intensity; 245m beam; runs 1.5 hours (Laser/LED concurrently); Laser best serve as runs 17 hours. Engineered optic produces a concentrated beam with optimum peripheral illumination. 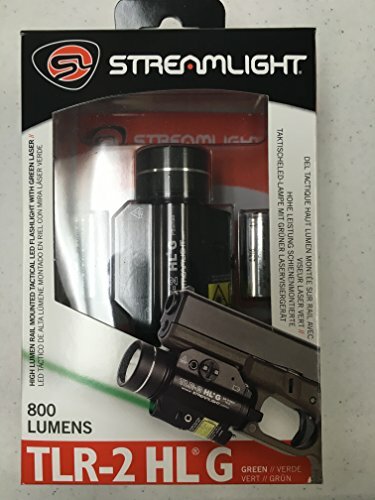 Green laser supplies prime-visibility long-vary focused on. Powered by two 3-Volt CR123 lithium batteries with 10-year storage life. Rail grip clamp system securely attaches/detaches briefly and safely with out a tools and with out hanging your hands in front of muzzle. Mounts instantly to handguns with Glock-taste rails and to all MIL-STD-1913 (Picatinny) rails. Includes keys for Glock-taste, Picatinny, Beretta 90two, S&W 99 and S&W TSW. Machined aluminum sealed construction with black anodized finish. Ambidextrous momentary/steady on/off switch. User programmable strobe can also be enabled/disabled. Fits existing light bearing holsters. 3.39-Inch (8.61 cm); 4.78-Pound (135.5 grams) with batteries. Operating temperature: -40 to +120 Degree Fahrenheit. IPX4 water-proof. Remote switches are to be had as optional accessories and will have to be used along with 69130 or 69161 remote door switch. All switches and door switch are sold one after the other. Restricted lifetime warranty. Assembled in USA.